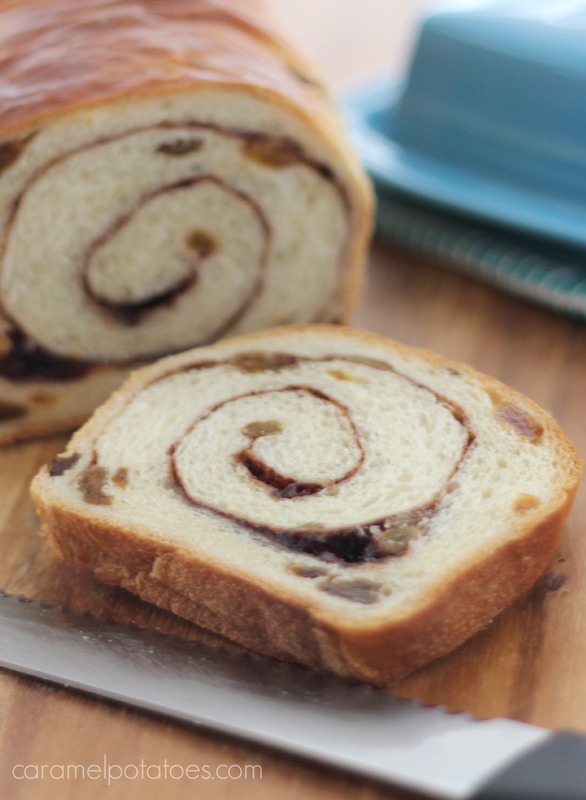 This Cinnamon Swirl Raisin Bread is a little slice of heaven. Seriously, pop a slice in the toasted and add some butter – mmm, good! Or better yet, make French Toast for an amazing breakfast! 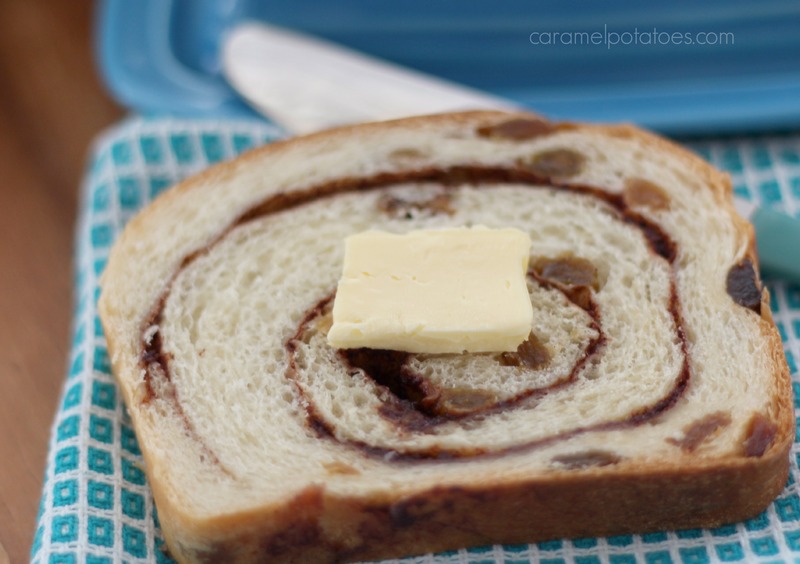 This bread is one of my husband’s favorite things – he loves to toast it and eat it with applesauce. Simple pleasures are the best. This recipe is not hard; however be sure to allow yourself extra time to let it rise four times. The results are so worth it. 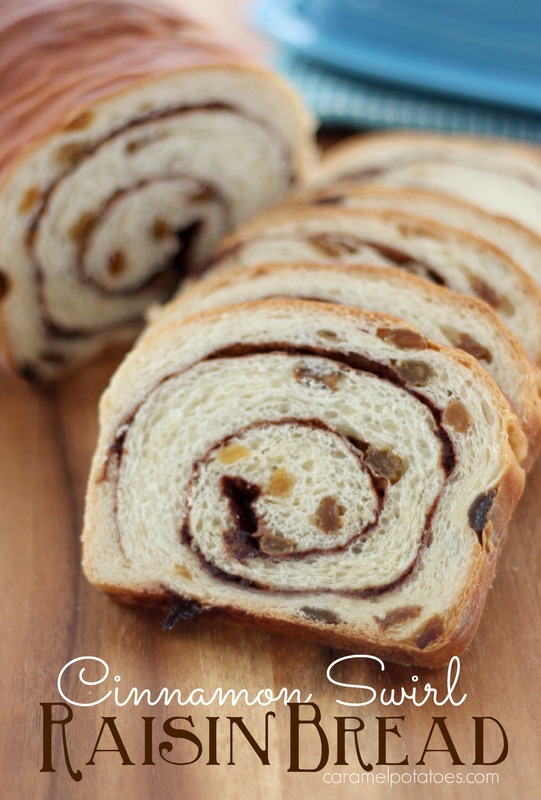 The cinnamon filling is made with powered sugar, and combined with the golden raisins it’s amazing! 1. For the Dough: Cut butter into 32 pieces and toss with 1 tablespoon flour; set aside to soften while mixing dough. Whisk remaining flour, milk powder, sugar, and yeast together in bowl of stand mixer. Using stand mixer fitted with dough hook, add water and egg and mix on medium-low speed until cohesive mass forms, about 2 minutes, scraping down bowl if necessary. Cover mixing bowl with plastic wrap and let stand for 20 minutes. 2. Adjust oven rack to middle position and place loaf or cake pan on bottom of oven. Remove plastic from mixer bowl, add salt, and mix on medium-low speed until dough is smooth and elastic and clears sides of bowl, 7 to 15 minutes. With mixer running, add butter, few pieces at a time, and continue to knead until butter is fully incorporated and dough is smooth and elastic and clears sides of bowl, 3 to 5 minutes longer. Add raisins and mix until incorporated, 30 to 60 seconds. Transfer dough to large greased bowl and, using bowl scraper or rubber spatula, fold dough over itself by gently lifting and folding edge of dough toward middle. Turn bowl 90 degrees; fold again. Turn bowl and fold dough 6 more times (total of 8 folds). Cover tightly with plastic and transfer to middle rack of oven. Pour 3 cups boiling water into loaf pan in oven, close oven door, and allow dough to rise for 45 minutes. 3. Remove bowl from oven and gently press down on center of dough to deflate. Repeat folding step (making total of 8 folds), re-cover, and return to oven until doubled in volume, about 45 minutes. 4. For the Filling: Whisk filling ingredients together until well combined; set aside. 5. Grease two 8½ by 4½-inch loaf pans. Transfer dough to lightly floured counter and divide into 2 pieces. Working with 1 piece of dough, pat into rough 6 by 11-inch rectangle. With short side facing you, fold long sides in like business letter to form 3 by 11-inch rectangle. Roll dough away from you into ball. Dust ball with flour and flatten with rolling pin into 7 by 18-inch rectangle with even ¼-inch thickness. Using spray bottle, spray dough lightly with water. Sprinkle half of filling mixture evenly over dough, leaving 1/4-inch border on sides and 3/4-inch border on top and bottom; spray filling lightly with water. (Filling should be speckled with water over entire surface.) With short side facing you, roll dough away from you into firm cylinder. Turn loaf seam side up and pinch closed; pinch ends closed. Transfer loaf to prepared pan. Repeat with second ball of dough and remaining filling. 6. Cover loaves loosely with plastic, return to oven, and allow to rise for 45 minutes. Remove loaves and water pan from oven; heat oven to 350 degrees. Allow loaves to rise at room temperature until almost doubled in size, about 45 minutes longer (top of loaves should rise about 1 inch over lip of pan). 7. Brush loaves with egg mixture. Bake until crust is well browned, about 25 minutes. Reduce oven temperature to 325 degrees, tent loaves with aluminum foil, and continue to bake until internal temperature registers 200 degrees, 15 to 25 minutes longer. 8. Transfer pans to wire rack and let cool for 5 minutes. Remove loaves from pans, return to rack, and cool to room temperature before slicing, about 2 hours. To Make Ahead: Baked and cooled loaves can be wrapped in double layer of plastic and stored at room temperature for 2 days. To freeze bread for up to 1 month, wrap it with additional layer of foil.